It’s commonplace to describe the financial crisis as a once-in-a-century event, but I question whether that is the case. Perhaps we’re not in the midst of a short-lived financial shock, but a long crisis that stretches back into the 1990s. The Fed chief told the G-7 that in almost fifty years of watching the U.S. economy, he had never witnessed anything like the drying up of markets in the previous days and weeks. Greenspan wasn’t speaking in Autumn 2008 when Lehman’s collapsed, however, but ten years’ earlier in the wake of the spectacular blow-up of Long-Term Capital Management, which lost $4.5 billion almost overnight in what the fund’s principals post-rationalised as a 100-year flood. Long-Term (with its superbly hubristic name) was brought low by derivatives, just as Lehman’s would be a decade later. The proximate cause of Long-Term’s failure was Russia’s Rouble crisis, when the country defaulted on its debt after the IMF refused to mount a second bailout. Time and again, panics in financial markets proved impervious to the ministrations of the people responsible for global economic policymaking. IMF bailouts fell flat in one crisis-stricken country after another, with the announcements of enormous international loan packages followed by crashes in currencies and sever economic setbacks that the rescues were supposed to avert. Ben Bernanke,his successor at the Fed, took a similar view. In 2005, he argued that, in response to the crisis, East Asian countries became net exporters of capital, rather than net importers. Even countries such as China, which had survived the crisis unscathed, built up reserves, in part to hedge against future financial turbulence. In practice, these countries increased reserves through the expedient of issuing debt to their citizens, thereby mobilizing domestic saving, and then using the proceeds to buy U.S. Treasury securities and other assets. Effectively, governments have acted as financial intermediaries, channeling domestic saving away from local uses and into international capital markets. In the meantime, the money that had flowed into emerging markets was looking for a home. During the dot.com era, it found it in technology stocks. But they crashed in 2001, costing investors $5 trillion of losses. To restart the party, Greenspan then cut interest rates savagely (and even more so after 9/11). Rates were down at1% well into 2004. As a result, the United States (and the UK and various other deficit countries) were faced by the toxic combination of low interest rates and what Bernanke dubbed a ‘global savings glut’ (e.g. lots of capital competing to find risk). And my, how the debtors loved it! Bankers went stark raving mad, lending standards collapsed, and a massive asset price bubble was inflated. It ended in a colossal hangover (mostly confined to the West, it should be remembered), once US housing prices finally started to fall in March 2006. The East Asian crisis (with hits on other countries outside Asia). The ‘subprime’ crisis, (which may itself be triggering another wave of sovereign debt crises). Admittedly, there was some push back to the notion that we are in the midst not of a shock, but of a slow motion car crash. But the connections seem strong to me. At the very least, it unwarranted to claim that recent events have been ‘unprecedented’ accidents that will only occur every century or so. 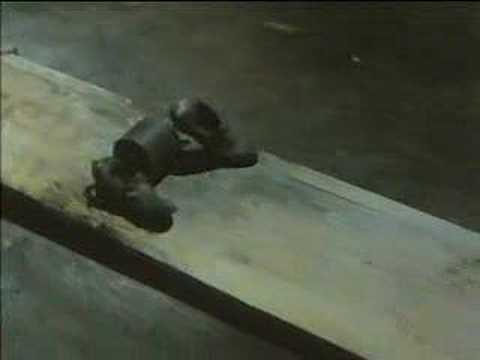 It all makes me think of The Way Things Go, a famous and fantastic film by the Swiss artists Peter Fischli and David Weiss – in which you watch unfold a chain reaction of levers, pulleys, slides, seesaws, and lots of whizzes, bangs and explosions. The full film is half an hour long, but the short clip at the top of this post gives you a flavour. The analogy is not perfect though. Fischli and Weiss understood the causality that tied together their mish mash of junk and chemicals. They could tell you where it was all going to end up. Their whole thing had been intelligently designed. Our economy, I think, has surpassed human understanding. We can bash, poke and kick it, and hope it will start running smoothly again. But it would be foolish to trust those who confidently pronounce this crisis over, and even less those who claim to know what is coming next. This entry was posted in Economics and development, Global Dashboard, Global system and tagged alan greenspan, Argentina, ben bernanke, Brazil, east asian financial crisis, Financial crisis, IMF, korea, long crisis, michael lewis, robert merton, robert rubin, russia, Thailand, UK, united states by David Steven. Bookmark the permalink.